Identifying the value in lean production means to understand all the activities required to produce a specific product, and then to optimize the whole process from the view of the customer. This workshop discusses the lean basics and value of Lean Manufacturing in a completely customizable option for your business’ specific needs. Your group is able to choose 1-5 days of workshop training to make sure you get exactly what you need. See the full course outline here. Contact RichardJ.Wells@SSDGlobal.net for more information or to register. Interested in hosting a workshop at your company? Contact us today for more infromation. On the first day of class, students are given a multiple choice test. This test will be compared against a test taken at the end of the class to measure progress. Students will explore the value of a product based solely on the customer’s point of view. Understanding that products must mean customer needs, both at a specified time and price. 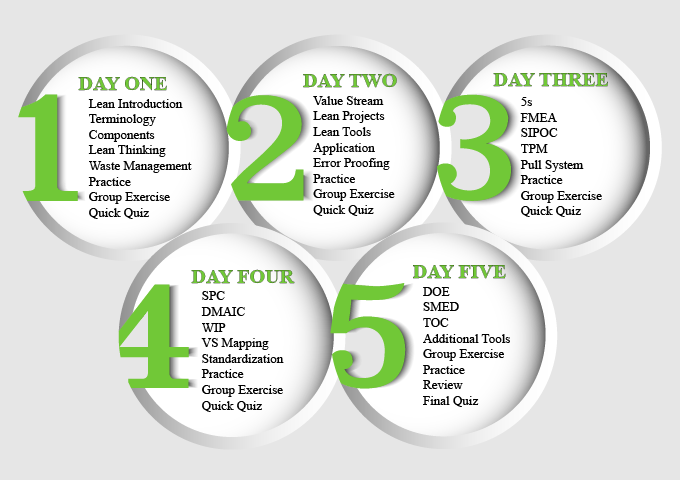 See the basic outline in the infographic below for specific tools and methodologies covered in the course.